Converse x Carhartt WIP team up on the One Star. Following on from last years Chuck 70 release, Carhartt WIP add their own twist to an icon from the Converse line-up, and this time around the One Star is up for adaptation. The first collaboration between the two brands arrived in June of last year, the first time the two brands have joined forces on a series of products. Both have a rich history behind them, and having built up a deep archive of products and signature material choices over the decades, there’s so much to choose from. Converse brought the low-top Chuck 70 to the table, and Carhartt WIP added the traditional Hamilton Brown Canvas, clean white canvas, and ‘Tiger Camo’ to cover the uppers of each shoe. For the second coming, the One Star takes centre stage, and hardwearing Cordura is the material of choice for all three colourways; black, white, and a dark army green. A Carhartt WIP patch replaces the tradition tongue branding, and features the ‘313’ Detroit area code as a nod back to the brands roots in the US. All three colourways of the Converse x Carhartt WIP One Star will be available via the size? previews app and in selected size? stores, priced at £90. 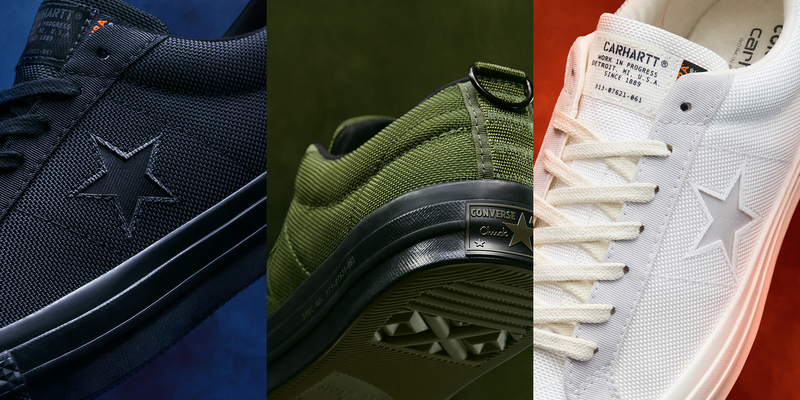 Take a look at our Converse ‘My One Star’ story with Mike Longshot.